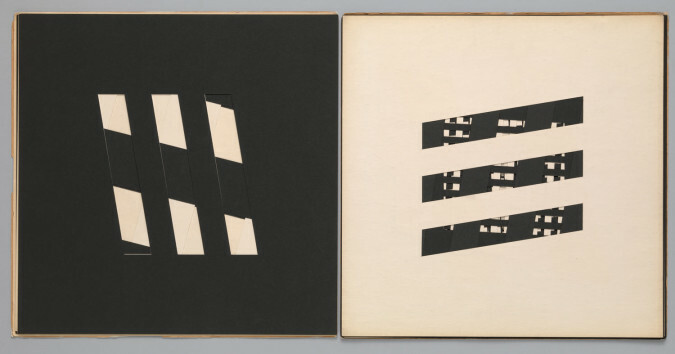 "Wait, Later This Will Be Nothing: Editions by Dieter Roth"
Dieter Roth, book c6 (1959), artist’s book of hand-cut cardstock, page 38.1 x 38.1 cm. Edition: unknown. Fabricated by the artist, Reykjavík. Published by forlag ed, Reykjavík. The Museum of Modern Art Library, New York. Photo: Jonathan Muzikar. ©2013 Estate of Dieter Roth. The German-Swiss artist Dieter Roth (1930–1998) experimented with nearly every medium available to him—painting, sculpture, drawing, graphics, music, video and installation—and developed a highly individual practice that transcends easy categorization. Perhaps for this reason the singular contribution he made in the decades following World War II has eluded the general public. Sarah Suzuki, Associate Curator in the Department of Prints and Illustrated Books at The Museum of Modern Art, has identified one of few consistent strains in Roth’s oeuvre: his unwavering dedication to editioned work. In the exhibition “Wait, Later This Will Be Nothing: Editions by Dieter Roth,” Suzuki assembled books, graphics and multiples made by Roth from the onset of his career in the late-1950s through 1971 (the year of a major traveling exhibition of his graphic work), prompting a reassessment of his legacy. In addition to constituting an enduring element within an otherwise diverse oeuvre, Roth’s editions gave rise to his most important breakthroughs. Although the exhibition was organized thematically, the introductory gallery consisted of early works that set the stage for later innovations. In the 1950s, Roth lived in Bern in a milieu of artists who practiced Concrete art and poetry. He tried his hand at poetry, publishing in the Concrete journal spirale, but negative criticism halted his efforts.1 He never abandoned his fascination with language, however, and in the late-1950s and early- 1960s he applied his experiments in geometric abstraction to the book format; along with American artist Ed Ruscha, Roth is credited with the invention of the artist’s book. 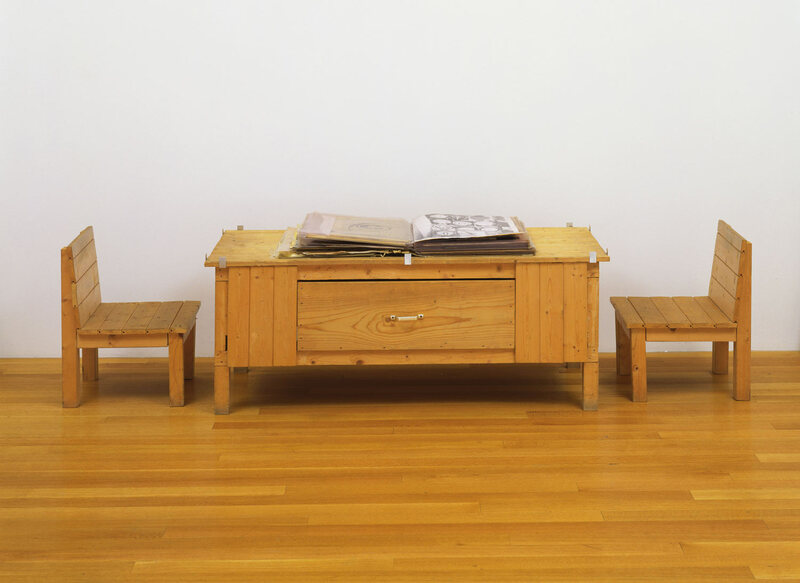 Dieter Roth, Snow (1964/69), artist’s book of mixed mediums, with wood table and two wood chairs. The Museum of Modern Art, New York. 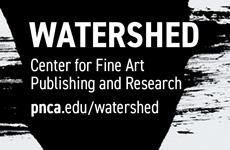 Committee on Painting and Sculpture Funds. Photo: John Wronn. ©2013 Estate of Dieter Roth. In the years that followed, Roth increasingly embraced the elements of chance and accumulation latent in Book. 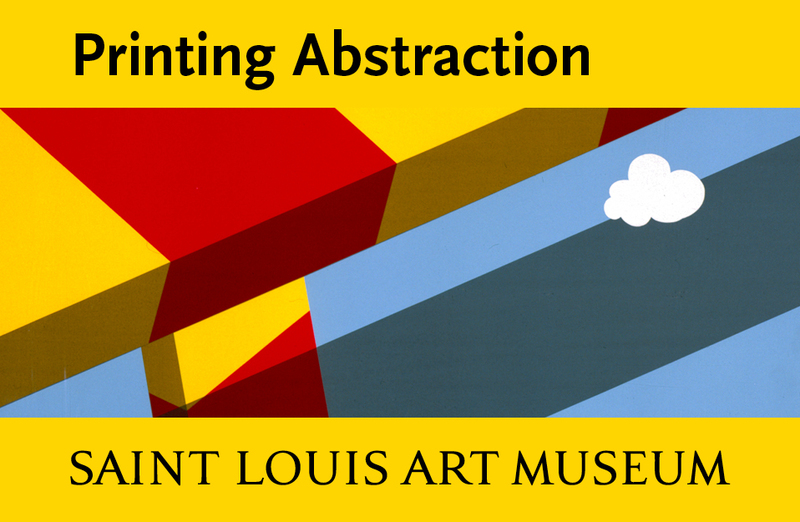 He soon eschewed geometric abstraction and began incorporating the objects and detritus of daily life into his work. In 1963, a professor at the Philadelphia Museum College of Art invited Roth to make a Concrete-style artist book. To the dismay of the professor, the resulting project was a far cry from the clean contours and optically stimulating color combinations of Roth’s earlier books. Snow (1964/1969) is an unbound compendium that presents the reader with an intimate glimpse of the unrestrained, frenetically implemented methods and techniques that would come to define Roth’s multifarious practice. According to the artist, Snow contained everything he had touched “in the way of paper,” including “drawings, sketches, photos” and paper he’d used to wipe printing plates.3 Doodles, notes of ideas for future projects and even a tiny wax sculpture in a plastic box are secured to the pages of Snow with glue, staples and paper clips. 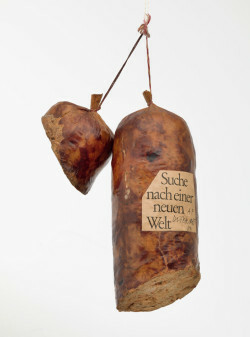 Dieter Roth, Literaturwurst (Literature Sausage) (1969, published 1961–70), artist’s book of ground copy of Halbzeit by Martin Walser, gelatin, lard, and spices in natural casing, 12 x 6 30.5 x 17 x 9 cm. Edition of 50 + 1AP. Fabricated and published by the artist. The Museum of Modern Art, New York. The Print Associates Fund in honor of Deborah Wye. Photo: Thomas Griesel. ©2013 Estate of Dieter Roth. 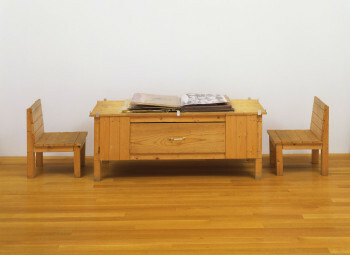 At MoMA this watershed work was afforded considerable gallery space—more pages were on public view than ever before—and the presentation included a desk and chairs the artist fabricated for its viewing. The exhibition’s title, “Wait, Later This Will Be Nothing,” was culled from a notation inscribed within the pages of Snow and attests to the work’s central status within the show. The title also alludes to the artist’s fascination with decay. Roth encouraged the physical deterioration of Snow by using non- archival materials such as cellophane tape. He also engaged concepts of disappearance and degradation, as in notations on his experiments with “faints,” produced using largely de-inked printing plates. Although adept in traditional print making processes, Roth characteristically favored unhinged experimentation over technical refinement. On view in a gallery dedicated to his printmaking experiments were works on paper that bear the faint traces—stains, really—of foodstuffs Roth sent through the printing press. Roth also reversed this process, substituting the printed page for minced meat in a traditional recipe for sausage to create his Literaturwurst (Literature Sausage) (1961–1970). The results are the most radical forms of artists’ books Roth produced. Enclosed within the sausage casings are the shredded pages of newspapers, magazines or works of lofty literature blended together with lard and spices. Roth studied languages and poetry as a youth; as an adult, he spoke about his envy of the giants of German literature.4 Grinding up books by the likes of Goethe and Hegel, Roth simultaneously destroyed and preserved the words of two intellectuals he detested but whose formidable legacies he could not escape. Dieter Roth, P.O.TH.A.A.VFB (Portrait of the artist as a Vogelfutterbüste [Birdseed Bust]) (1968), multiple of chocolate and birdseed, overall 21 x 14 x 12 cm. Edition of 30. Fabricated by Rudolf Rieser, Cologne. Published by Hake Verlag, Cologne. The Museum of Modern Art, New York. Sue and Edgar Wachenheim III Endowment Fund and acquired through the generosity of Peter H. Friedland. Photo: John Wronn. ©2013 Estate of Dieter Roth. While sausage is a mainstay of German culinary culture, chocolate is a cornerstone of the Swiss diet, and Roth, who was born in Germany but largely raised in Switzerland, returned to the motif of chocolate throughout his career. 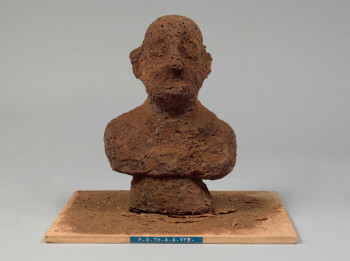 The material figures prominently in his multiples of the late-1960s, the culmination of which is P.O.TH.A.A.VFB (Portrait of the Artist as a Vogelfutterbüste [Birdseed Bust]) (1968). The work, whose title is a play on James Joyce’s Portrait of the Artist as a Young Man, is a self-portrait as an old man. Made of chocolate and birdseed and published in an edition of 30, the bust is meant to be placed outdoors to be consumed by birds. Simultaneously enticing and repellent (the seedy chocolate resembles excrement), the work subverts the traditional notion of the marble bust as an icon of immortality. With this poignant gesture, Roth insists that nothing is permanent, neither his artistic output, much of which has decayed, nor the subject of his self-portrait: the artist himself. Roth’s work presents certain challenges to the museum curator. The preservation of objects designed to deteriorate is antithetical to the artist’s intentions. Likewise, the cordoning off of books inside display cases prohibits reader participation. 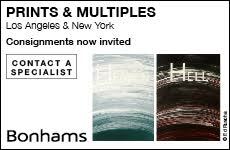 To present Roth’s work in an accessible manner further risks losing the complexity of meaning inherent to his practice. As “Editions by Dieter Roth” rightly argues, however, such risks are worth taking, as Roth’s practice was a game-changer—one whose influence endures to this day.